Zach will be a top perormer in '07. Robbie possesses tremendous leg stregth and great athletic ability. He is one of the best in the nation. Kevin is an extremly consistent placekicker. Eric has worked hard to improve his technique this off-season. 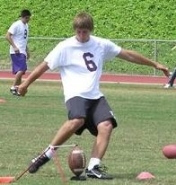 Louis has increased his abilties tremendously this off-season and is one of the top Seniors in California in 07. Travis is an extremely consistent and accurate placekicker..
Christian has emarkable leg strength on FG's and is a power kickoff guy. Kyle gets the ball up very quickly on FG's. Dejon possesses tremendous leg speed and great athletic ability. Austin is an extremely accurate and consistent placekicker. 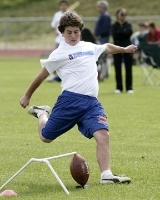 Brock is an extremely reliable placekicker with a bright future. The complete package. Max has improved his technique tremendously and will be an asset to his team. Averaged 39.0 y/punt and connected on a 48 yd FG. 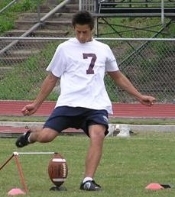 Tim has tremendous leg strength and will be a solid kicker in '06.